General dentistry in Sioux City IA including custom crowns, digital imaging! Dr. Salmons believes you should receive all the benefits that current technology has made available. Every day new developments are refining dental precision and expanding your comfort. New approaches are improving fundamental procedures and creating all-new treatment possibilities. The capacity to identify issues sooner, when they’re small, means less-invasive treatment and faster recovery times. Inquire today and see what these innovations can mean for you! 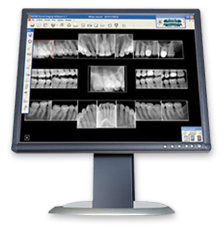 Digital X-rays generate views of your teeth that can’t be achieved with traditional film systems. With a digital sensor placed in your mouth, Dr. Salmons can collect the images and display them immediately on a monitor. Without jeopardizing any of the original content, images can be magnified, expanded, rotated, or color-coded. With digital files, current images can be laid over earlier images to emphasize deviations in your dental health. With digital X-rays, the lag time that stemmed from film being developed has been eliminated, which means a shorter office visit for you. In addition, this cutting-edge technology shrinks your exposure to radiation by 75% as compared to conventional non-digital X-rays. Much like a panoramic X-ray, a cephalometric (ceph) X-ray encompasses a full view of your skull, neck, and mouth, allowing Dr. Salmons to see a complete side image of your internal structure. A ceph allows him to obtain precise measurements of your teeth, including their root structures; determine why teeth may be misaligned, such as problems with underbite or overbite; and plan extensive, accurate orthodontic work. As you’re obligated to make certain detailed decisions regarding your oral health, Dr. Salmons believes you should have the most comprehensive information available. To make this possible, he uses a high-tech tool known as the intra-oral camera. 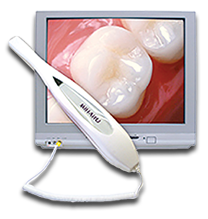 This groundbreaking video system supplies a clear, close-up look at the interior of your mouth, generating magnified images on a monitor. Now, you can see for yourself what work needs to be started and which teeth are doing well. You’ll be astounded by what you can see! Have you ever had a dentist discover a sizable new cavity that necessitates a massive filling, but leaves you questioning how it’s possible, when the cavity wasn’t even there on your last six-month check-up? Well actually, it existed during your prior visit, but couldn’t be detected on the X-rays or with a visual inspection. Sometimes patients will complain of tooth sensitivity or mild to severe pain, yet X-rays and visual scrutiny can’t identify the source. These patients are often provided with sensitivity toothpaste that doesn’t relieve the problem. Dentists have even performed root canals to get the pain or sensitivity to stop, when the physical source was an undetectable amount of decay. All these reasons and more are why Dr. Salmons uses a laser scanner to reveal cavities in their earliest stages: at a time when they can be repaired with only a tiny filling. You won’t depart his office wondering whether the start of a new cavity has been missed. He can discover cavities and take care of them before they become bigger problems. 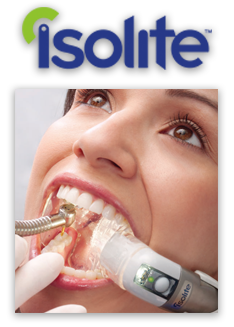 Isolite has revolutionized dentistry. It’s a suction device, which creates the necessary dry “field” needed for modern dental procedures, joined with a brilliant light that illuminates the oral cavity and abolishes shadows. This means that on average, treatments take a third of the expected time, freeing you from the “chair” faster. Because saliva doesn’t build up, you won’t experience that “drowning or gagging” feeling. Debris won’t be swallowed because your mouth is constantly “vacuumed.” Your mouth won’t experience jaw fatigue because the unit helps hold your mouth open. And more light allows Dr. Salmons greater accuracy. Welcome to dentistry in the 21st century! Dr. Salmons is pleased to offer crowns made with CEREC™, a highly precise computer milling machine that makes crowns right in the office, while you wait. No more temporaries, additional visits, or crowns that don’t seem to fit right. CEREC crowns are convenient and aesthetically desirable, but that doesn’t mean you have to give up function. These modern restorations dramatically reduce cracking, lowering the likelihood of needing future root canal treatment. Due to the custom design and precise fit, CEREC restorations are bonded to the tooth with the optimum strength available. If you have ever had a crown placed the traditional way, we are sure you will notice the difference! Nothing beats an easier, more comfortable dental visit. If you have questions about the latest dental technology, give us a call today at (712) 239-5900.